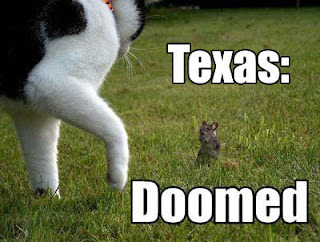 DTFizzix Science News: Texas Is Doomed Yet Again! Texas Is Doomed Yet Again! This just came across my desk from Dr. Kevin McLin of NASA at Sonoma State U in sunny Calif; arguably the 5th or 6th smartest guy I've ever met. (I'm the 1st, of course...) It is to weep. I thought I was done picking on the stupidity and closed mindedness of Texas educational system, but guess not. Seems the state of Texas has decided to cut 60% of the physics programs in the Texas state university system. I'll let that sink in for you, my gentle flowers... Yes, this is decidedly anti-education. Here's my take on this... Since G. Dubbya, we have been "striving for mediocrity" in this country educationally. No Child Left Behind, NCLB, is the single most dangerous legislation ever placed on the public's plate. It has seriously wounded the pursuit of excellence. As much as the politicians and the politically oriented and appointed Secretaries of Ed have tried to tell us that NCLB does not put more emphasis on a single test, it does. Simply as that. Anyone who tells you differently is either totally ignorant of the inner workings of NCLB AND the educational system or he/she is a politician; meaning he/she is clueless. Every state, every district, every individual school is evaluated on a single "one-size-fits-all" test. In CT, it's the CAPT. In NJ, it's the HSPA. In W VA, it's a sobriety test. In CT, GHS is compared to other schools in our "DRG", DemoGraphicGroup. We fair so-so on the CAPT in some areas. We fair not-so-so in some areas. THAT is what the public sees; the lack of our school population attaining a 100% mastery on every single part of the CAPT. Mind you, the CAPT here at GHS is not, I repeat, NOT a graduation requirement. At most of the other schools, it is. Now, it shouldn't matter, but it does; Duh! 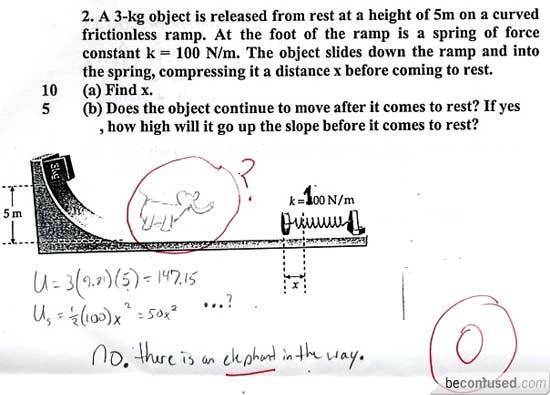 Kids know it's not required for them to pass this poorly written test. So, the kids who couldn't possibly care less don't. (Care less, that is...) Since they don't care, they do poorly. I've proctored exams where a kid or two close the exam booklets within 3 minutes after starting a 60 minute exam. Duh! However, if anyone is interested in looking, GHS beats the snot out of just about everyone else in CT on the advanced exams that actually get kids into colleges. The Texas decision bites right into that "advanced" group of kids that we as a nation point to as evidence that we as a nation actually do something right! Get rid of the options for the highest level kids, what do they have left? When I started college back in 1971, yes there were colleges that long ago, there were 96 physics majors in the Freshman class. By the time I graduated, there were 4 of us. Yes, it's a tough major. Yes, it's challenging. Yes, there are easier majors if you want to go that route. However, just because there are only 10 Seniors left at UT as physics majors does not mean the money spent on them (THEIR OWN FRIKKIN' TUITION MONEY, by the way) was a waste. Those 10 kids will go on to grad school and invent something that will help us or find the Higgs Boson or be the first human standing on Mars or be a drag on the welfare system because he's a lazy no good for nothin... Oh, sorry. I digress... Advanced kids NEED us! As far as I'm concerned, there is no more important issue facing American education than this. We are cheating our bright kids out of a truly challenging worthwhile education. C'mon, Obama. Do the right thing and help these bright kids! Secede Texas! Original article. Visible Supernova in our Galactic Backyard!